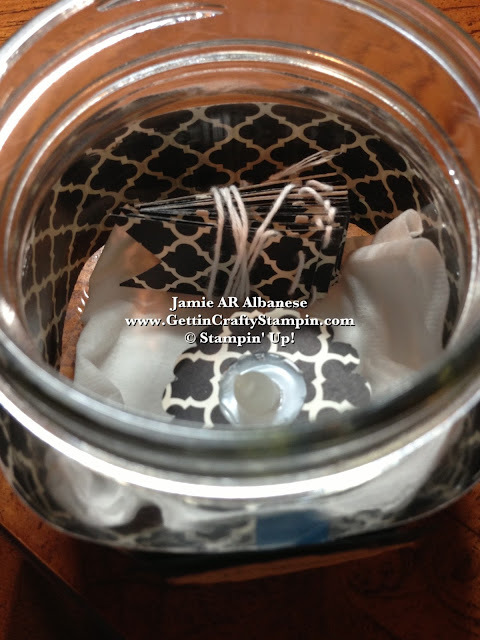 Getting Crafty with Jamie: Man Birthday in a Jar! Man Birthday in a Jar! I grew up loving the old pictures and movies that represented the Roaring 20's... Men in Pin-Striped Suits, well tailored, Women in Flapper dresses... (so much so that I found a flapper style dress at a thrift store and wore it exclusively for months when I was a young girl - lol.. every day after school....). This Jar from our recent Joy in a Jar class reminds me of just that - a well groomed and tailored man. 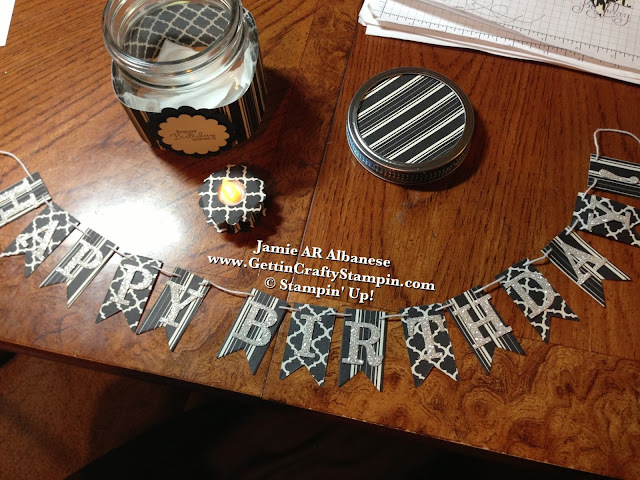 Designing for a Man isn't always easy but this Birthday in a Jar came to life in Orfa's hand!! 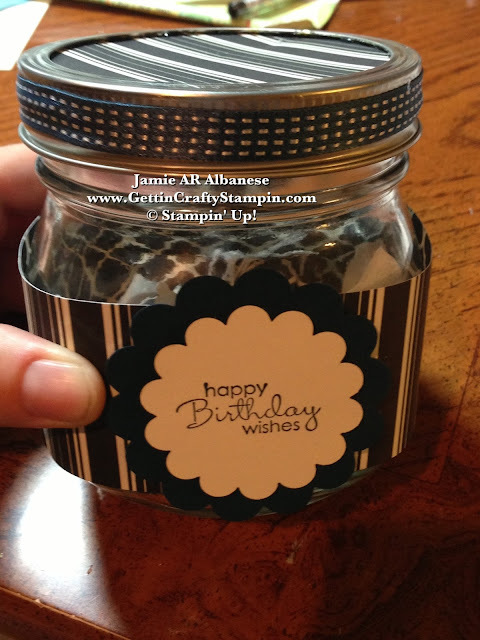 What a wonderful job, and I'm sure you'll be bowled over by this masculine birthday in a jar! Our Petite Pairs stamp set (#122497) is the fun sentiment for this jar. Our Modern Medley (#126926) Designer Series Paper is a wonderful collection of sharp and vintage Basic Black and Very Vanilla. Open this up for a wonderful birthday surprise!! 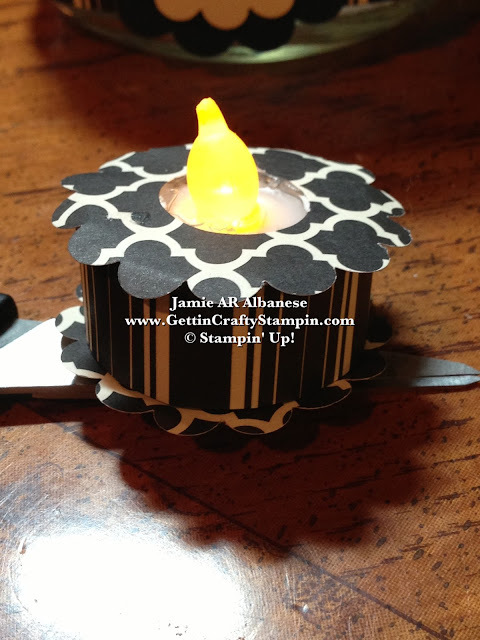 A battery operated tea light birthday cake and a Banner Birthday Wish! Our Silver Glimmer paper (#124005)add sparkle to a special day. The Typeset Alphabet Bigz Dies (#127553) and Big Shot Die-Cutting Machine and super hero tool (lol) #113439 allow us to spell out any celebration!! Whisper White Baker's Twine (#124262) wrap up and hold together your wishes! Midnight Muse stitched satin ribbon (#126847) give a sharp, tailored look. 1-3/4" Scallop Circle punch (#119854) and the 2-3/8" Scallop Circle punch (#118874) create a great birthday centerpiece to this RePurposed jar... open up some love and fun! 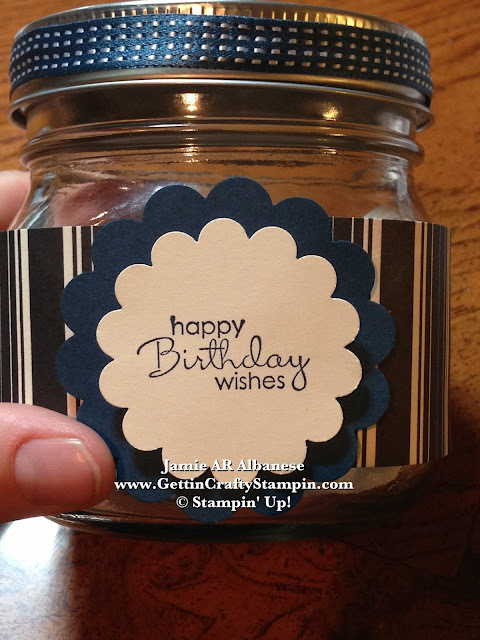 Who would you gift this birthday wish, a party in a jar, to?? My hubby isn't a tailored kind of guy but he'd love something like this, who wouldn't?? 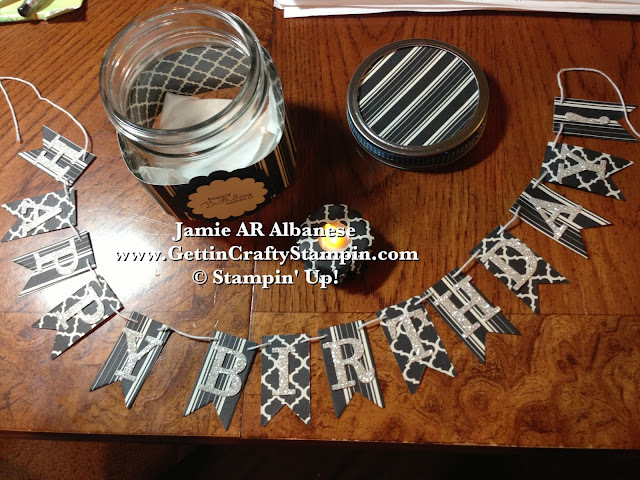 CLICK HERE to see my upcoming classes and join in on the fun!! CLICK HERE to see our amazing papers, tools, stamps, accessories and you, too, can craft and have fun doing so!! Thanks for coming by for a great visit! I look forward to seeing you again and soon!